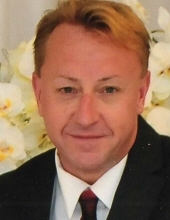 Kevin Dwayne Redden, age 50, died Thursday January 3, 2019. He was born December 4, 1968 in Oklahoma City, OK to Bill and Alice (Scott) Redden. He was a 1987 graduate of Moore High School, earned his master’s degree from University of Central Oklahoma and was currently working towards his doctorate. Kevin was a licensed therapist for Quest. He was dedicated and devoted to help those less fortunate, volunteering at the homeless shelter, cancer foundation and the children’s foundation. He was preceded in death by his father Bill E. Redden and grandmother Annie Lanham. Kevin is survived by his husband Thyrun Redden, mother Alice and brother Bobby Redden and wife Sherissa, also by nieces; Jessica and Ashlyn, one great nephew Aiden and two great nieces Emma and Zoey and nephew Brandon Griffin. A Memorial Service will be held 2:00pm Thursday, January 10, 2019 at McNeil’s Funeral Service, Mustang, Oklahoma. To send flowers or a remembrance gift to the family of Kevin Dwayne Redden, please visit our Tribute Store. "Email Address" would like to share the life celebration of Kevin Dwayne Redden. Click on the "link" to go to share a favorite memory or leave a condolence message for the family.